Plastic components are used extensively in modern vehicles - and with good reason. Plastic is relatively lightweight, easily formed into complex shapes, cheap to produce and - depending on the compound - is quite strong and durable. However, components such as bumper bars, taillights and grilles are susceptible to accident breakage, and often it's cheaper to have them repaired rather than replaced. The process that we can thank for this is plastic welding. 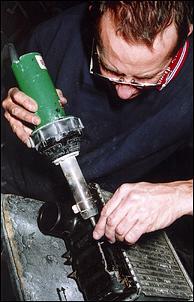 The first step in the plastic welding process is to identify what type of plastic is to be repaired. 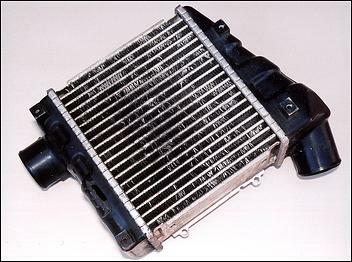 Car manufacturers use various plastics for different applications; for example, polyethylene is commonly used for inner guard liners and washer bottles, polycarbonate is sometimes used for taillight lenses and polypropylene is used for battery and fan shrouds, heater boxes and some trim panels. To make compound identification easy, many automotive components have a production stamp; these include abbreviations such as PE (polyethylene), PC (polycarbonate) and PP (polypropylene). 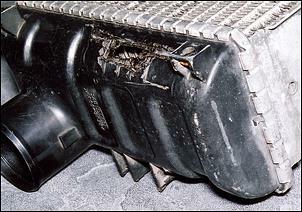 Note that nearly every automotive plastic can be welded. In this particular case, Toyota had marked our intercooler end-tanks as PA-66; PA represents polyamide compound, while the 66 suffix indicates the use of a glass additive. 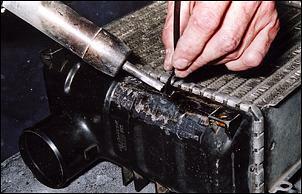 Polyamide plastics are regarded as reasonably high-strength, and are often used for bearings and gears. Also, note that polyamide is commonly known as nylon. Despite assurances that PA-66 is theoretically 'weldable', we wanted to make absolutely sure that our end-tank could be repaired with significant strength; after all, the intercooler has to withstand turbo boost pressure. A quick test was to melt a scrap piece of compatible donor material - in this case, the end of a nylon cable tie - to the damaged end-tank. When a strong bond was quickly formed between the two like compounds, we realised everything was on-track for a durable repair. The test cable tie was then removed with the aid of the hot iron. These fine cracks were fixed by welding a polyamide V-shape rod into the area using a heavy-duty heat gun. Interestingly, each type of plastic requires a like compound welding rod and a specific welding temperature. Most common automotive plastics require a set welding temperature between 280 and 400 degrees Celsius - our polyamide end-tank required the full 400. Following the heat gun, our repairer pushed down on the filled cracks with his hot iron and added more polyamide rod wherever necessary. 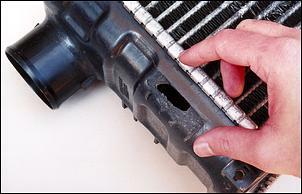 This step helps to compress the plastic and remove any air bubbles in the affected area, giving enhanced strength. As mentioned, an important consideration in the case of our intercooler end-tank repair was strength - would it be able to withstand boost pressures of up to around 15 psi without a problem? We made very sure that our repairer understood the internal pressures that the end-tanks would endure, and - accordingly - he decided that there should be two separate parts to the repair; a near flush-fitting patch plus an external cover. 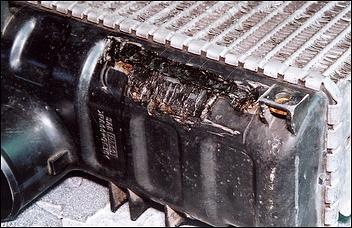 Without having access to the original piece that broke off the end-tank, the patch part of our intercooler repair involved welding a cut-to-size piece of polyamide (nylon) material into the immediate area of the hole. This donor polyamide plastic was actually part of another vehicle's grille. As previously, our repairer reached for his 400 degrees Celsius heat gun and polyamide V-shape welding rod to weld the edges of the patch. Again the iron was then used to compress the compound around the edge of the patch. 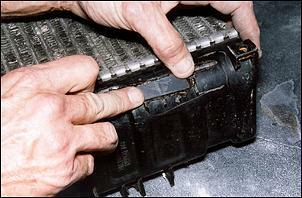 Once the patch looked airtight and secure, a cover was placed over the top to provide added repair strength. Due to the uneven contours of the intercooler end-tank, a handful of flexible (6mm wide) nylon cable ties was the perfect choice to form the cover. A parallel series of these ties were laid over the patch repair - with generous over-hang all the way around - and each one was heat-gun'd together, forming a large cover. Again, the trusty iron was used to compress the area tight. Completing this hour-and-a-half job was the cosmetic side of things. Due to the heavy-duty nature of our repair, only a light grinding was required to tidy up the edges and any major hairy bits. A hit of black spray paint helped to hide the repair. For repairs where the end result must be undetectable (such as plastic bumper bars), it's common to grind off any added material that doesn't sit flush with the component's body. 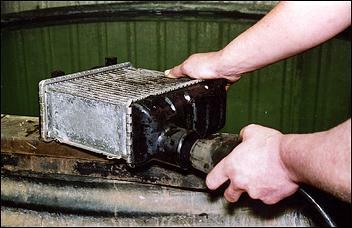 Remember, though, grinding removes valuable plastic material - and strength. With a flush repair, the component can then be painted over or covered with a grained surface (as sometimes found on older-style plastic bumper bars). 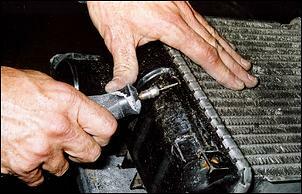 So what comments did our trusted repairer have to say about this specific intercooler repair? Well, most importantly, he would have liked to also weld the inside of the patch. 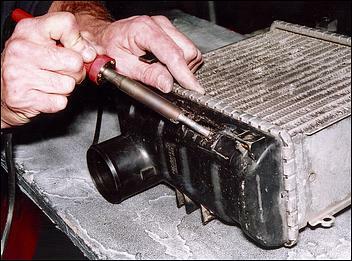 Unfortunately, though, this was not practical due to the difficulty in removing and replacing the series of clips that hold the end-tank onto the main body of the core. Due to this hindrance, we were not given the company's usual 12-month warranty on plastic welding repairs - though we feel confident enough to go away and put the core into action. And the cost of the repair? A bargain $50. 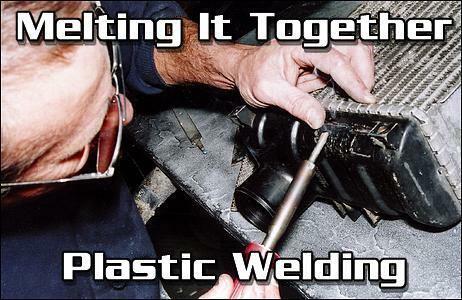 As you can see, plastic welding can be a cheap alternative to buying replacement automotive parts. It's worth checking out. To ensure that our end-tank repair was airtight, we took the intercooler along to a local radiator repairer for a water tank pressure check. With the intercooler outlet pipe plugged and the inlet pipe being fed up to around 18 psi air pressure, we held the unit under water and watched for any leaks. 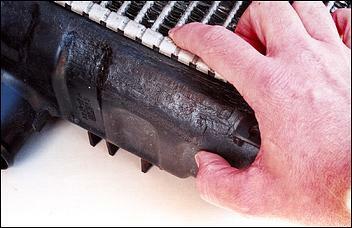 The absence of any air bubbles indicated that the plastic welding repair had been completely successful.